Vancouver, British Columbia--(Newsfile Corp. - March 20, 2019) - Dunnedin Ventures Inc. (TSXV: DVI) (the "Company" or "Dunnedin") today announced results from 109 till samples collected in the Josephine Target Area (JTA) during the fall of 2018. Results have defined a discrete target area for potential diamond sources of 3 km2 at the head of the JTA, a trend of abundant high-quality diamond indicator minerals (DIM) for which no source is known yet. Although the focus of Dunnedin's near-term exploration plans will be on its recently expanded portfolio of large-scale copper porphyry projects in Canada and the USA (see news releases of November 29, 2018 and March 4, 2019), the Company's next diamond-focused exploration campaign will be aimed at the discovery of kimberlite pipes within this newly defined area. 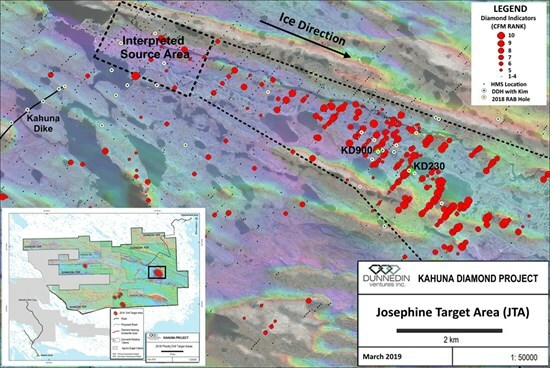 "The Josephine Target Area is the most intriguing and prospective area on the Kahuna project," said Claudia Tornquist, President of Dunnedin. "We believe it has exceptional potential for the discovery of one or several large diamond sources. With the help of our advisor, diamond expert Dr. Chuck Fipke, we have systematically analysed a large number of samples across our property over the course of four years to vector in on new diamond-bearing kimberlites. Last year's exploration program and this latest batch of samples was a big step forward as we now have narrowed down our search for new diamond-bearing kimberlites to a small area of only 1,500 m by 2,250 metres. We are pleased that the recent sample results show a clear cut-off of the indicator mineral train, signifying that we are now close to the one or more diamond sources. The next step will be to define discreet drill pipe-like targets for our next exploration program." Till samples collected on the Kahuna property are shipped to the CF Mineral Research Ltd. ("CFM") laboratory in Kelowna, BC for processing and analysis. Using a scanning electron microprobe ("SEM"), CFM employs proprietary mineral chemistry filters and classification criteria to determine diamond indicator minerals ("DIM"), which distinguish indicator minerals that formed with diamonds from those just associated with kimberlite host rocks ("KIM"). Sample sites are subsequently ranked from 1 (low priority) to 10 (high priority) based on both the quantity and quality of DIMs and quantity of KIMs in each sample. CFM operates using reference standards, internal quality assurance protocols, security and operating procedures for processing, recovery and reporting of results. The CFM laboratory is accredited and audited for international quality standards through the International Organization for Standardization/International Electrotechnical Commission (ISO/IEC) 17025:2005, which includes ISO 9001:2015 specifications. Based in Vancouver, Dunnedin is part of the Discovery Group of companies led by John Robins, a mining entrepreneur who founded and chaired of Kaminak Gold which Goldcorp acquired for $520 million . Dunnedin's management team has significant capital market strength and is backed by an experienced team of exploration experts with a track record of discovery.